Thanks to its two separate refrigeration and blending systems, Pro 6000 is the only Gelato machine on the market that can be used to prepare two different flavors at the same time. The unit also features two removable bowls, which are yet another unique feature of this product. This means you can process up to 1.5 kg. (1 ½ Quarts) of mixture in each bowl every 20-40 minutes, based on the temperature requirements of your mixture and recipe. With Pro 6000 you can work your mixture directly into the fixed bowls, thus minimizing preparation time and increasing your working capacity. 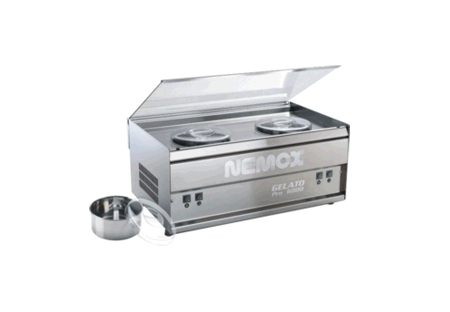 Thanks to the unit cover, made of hardened glass, you can conveniently use the machine as a counter top when not in use. Each bowl comes with a plastic lid. The machine body is entirely made of stainless steel, like the mixer blade, featuring replaceable silicone inserts. The blender motor is provided with an automatic reset thermostat.